La Sorbonne: Historical house of the former University of Paris. Entry is in principle reserved for students and faculty. 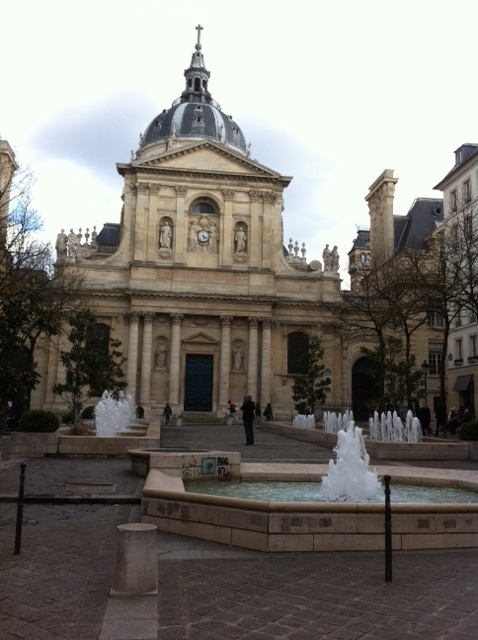 But it is possible to visit the Sorbonne if you arrange for a tour ahead of time. Musée National du Moyen Age or Cluny Museum: A medieval residence that now houses the National Medieval Museum is dedicated to the arts, daily life, social and religious history of the Middle Ages in France. The famous Flanders tapestry, “The Lady and the Unicorn”, is displayed there. Panthéon: Formerly the church of Saint Genevieve. Since the French Revolution, it has been the final resting place of a select group of individuals who have served France in exceptional ways (Mirabeau, Voltaire, Rousseau, Victor Hugo, Zola, La Fayette…). The St.-Etienne du Mont Church: Contains the shrine of St. Geneviève, the patron saint of Paris and stained glass of the 17th century. Rue Mouffetard: One of Paris’s oldest, many restaurants, shops, and cafés, and a regular open market. Luxembourg Gardens and Palace: Owned by the French Senate. Paris’ favorite place to sun and picnic. The garden contains a hundred statues, monuments, and fountains. Place Saint Michel and the famous fountain.